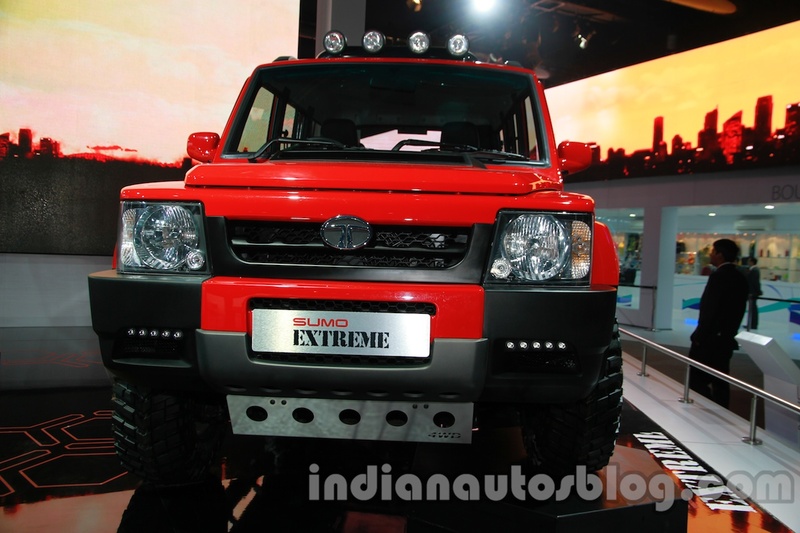 The Tata Sumo Extreme concept is based on the Victa and made its debut at the 2014 Auto Expo. The official modification retains the original design language but features an enhanced styling package courtesy of several new bits. These add-ons make it look like a thoroughbred SUV rather than a bare-essential MUV. The concept model carries a dual-tone exterior paint scheme, new alloy wheels shod with wider tires, a reworked hood, and roof-mounted auxiliary lamps. Other changes include a revised upper grille, a skid plate, a reworked bumper with LED DRLs, flared wheel arches, a revised interior entertainment package with a roof-mounted display, one-touch power windows, and new seat upholstery. This modified Tata Sumo has a pretty neat look in spite of the several updates it carries. The highlights of the front-end include an aftermarket bullbar that is flanked by two LED lights at its either end and a couple of aux lamps mounted on it, and reworked headlamps with BMW-inspired angel eyes. In the side profile, it carries a set of black alloy wheels that are shod with wider tires. The front doors get a 'star' decal each. 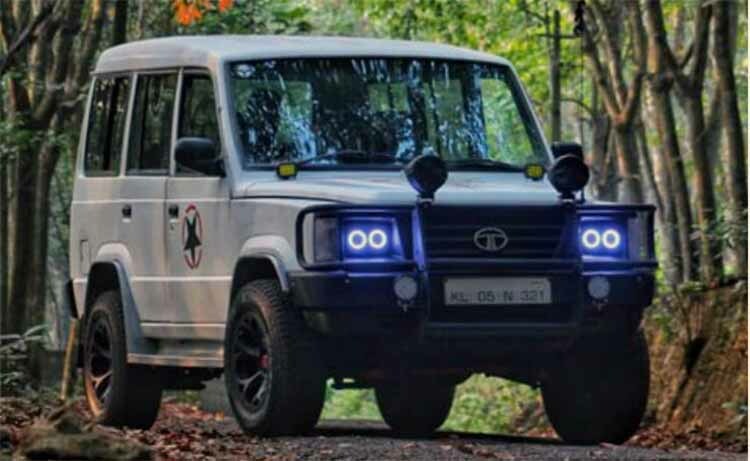 The modified Tata Sumo is an Army-spec model that can't be bought for civilian-use. 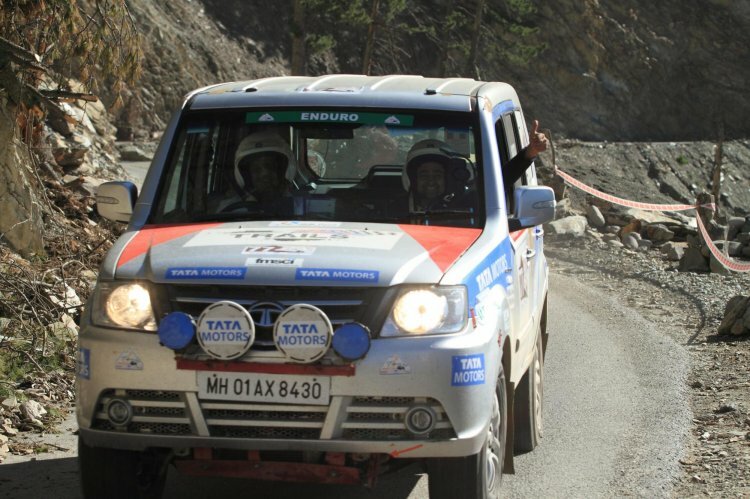 It's noteworthy here that Tata has supplied 4x4 versions of the Sum to the Indian Army. The vehicle pictured features a different set of steel bumpers at the front and rear, while the wheel arches have been altered to allow higher wheel travel and accommodate the bigger 33*12.5*15 inch tires. The Army-spec Sumo even carries a snorkel, a 14-litre Tropicool fridge, a 0.5 KVa inverter with a 5 amp power output socket, rock sliders, LED lamps up front, and a leather interior upholstery. The Tata Sumo Grande, which went on sale in 2008, is the second generation of the company's popular people-mover. Here is a modified example that has been done up by Big Daddy Customs, who had been given a contract to alter a set of Tata vehicles by the manufacturer itself. As per the requirements of the company, the modified Sumo Grande above carries only new soft parts, with its sheetmetal remaining untouched. The reworked vehicle features a new bumper and a revised front grille, both of which come together to give the front-end a more dynamic look. Furthermore, the Grande gets a set of new side steps, an updated rear bumper with integrated LED lamps and black-painted alloy wheels. Another highlight of the mod-job is its dual-tone paint finish with marine blue base paint and matt grey highlights. 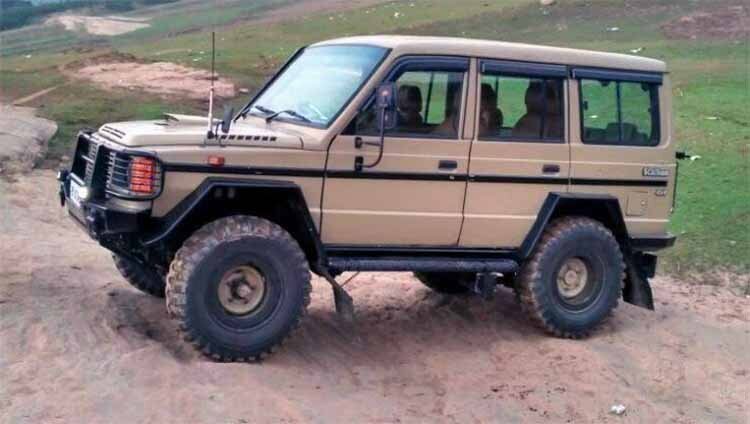 The Tata Sumo Grande was even used by the manufacturer in the 10th edition of the Desert Storm. The rally-spec Sumo seen above also went on to bag the first prize in its category. 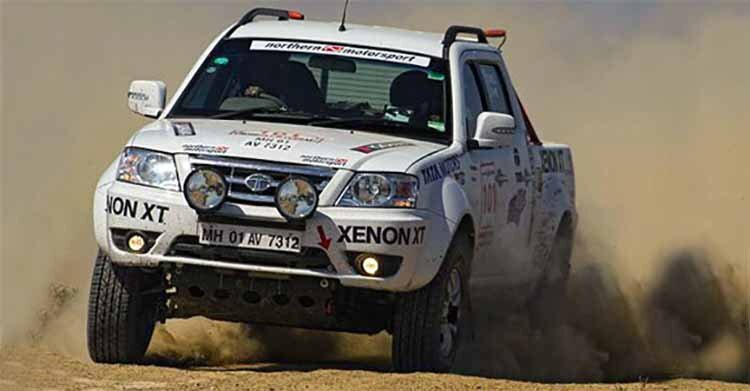 The modified vehicle used for the country's most gruelling rally featured 4X4 hardware and several minor modifications, including a new set of alloy wheels with wider tires, a re-tuned engine, race-spec bucket seats, and a sump guard. 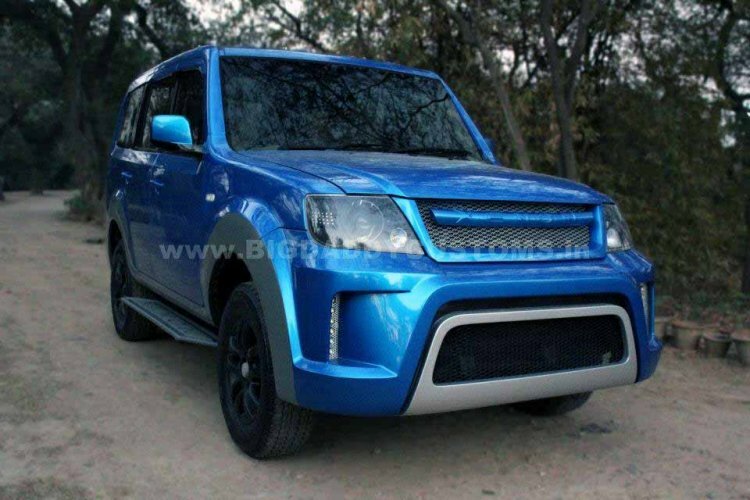 Here is a 2014 Tata Xenon that doesn't get performance updates but looks brutish owing to the various visual upgrades. It features an off-road-spec bumper with bullbar and embedded fog lamps, a revised hood with a functional hood scoop, and roof-mounted warning lamps and a massive LED light bar. Even the upper grille is new and carries a blue LED light, while there is a small LED light bar below the front registration plate. Moreover, the modified Xenon gets bolder wheel arches to accommodate the wider track, while the rear receives a large tyre carrier, a metal bumper and twin exhausts. The biggest highlight comes in the form of the suspension lift kit that makes the pickup taller and bestows it with a much bolder stance than the stock vehicle. 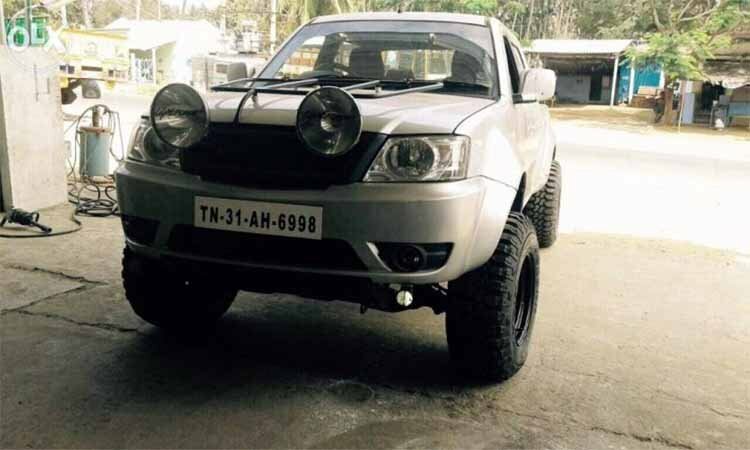 While the first vehicle in our list of modified Tata Xenon pickups carried several styling updates, the one above features a pretty neat look with only a handful of modifications that jazz up its exterior. Up front, you get a massive pair of fog lights that have been mounted on the blacked-out grille. In the side profile, it features bigger steel wheels shod with huge all-terrain tires. The new wheels & tires and the reworked suspension leads to a bolder stance and hence, a higher street presence. Like the Tata Sumo Grande, even the Xenon has been used in the 10th edition of the Desert Storm by Tata Motors. The dual-cab variant that was used in the rally featured a reworked engine, a revised suspension, race-spec bucket seats, an exterior roll cage, a pair of aux lamps, and 4x4 hardware. 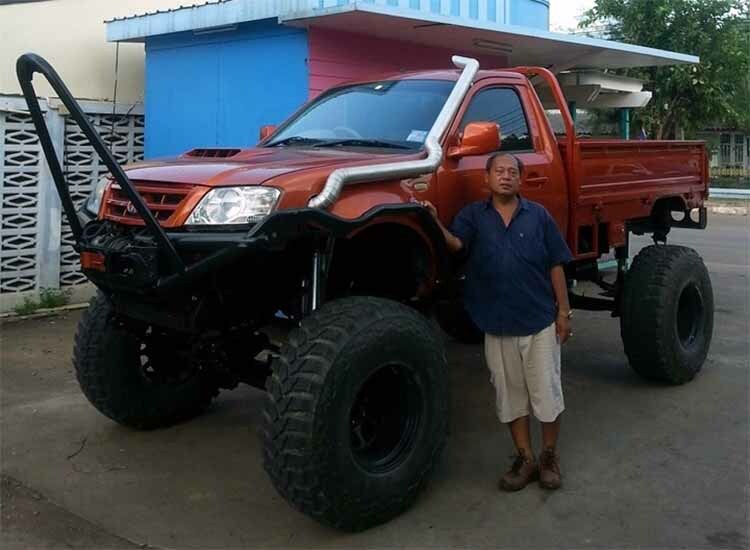 Here is a Tata Xenon from Thailand that looks outlandish owing to its monster truck-like appearance. 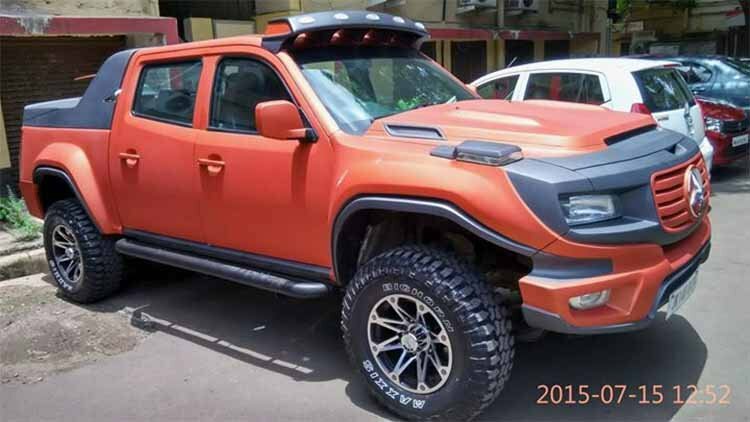 The vehicle seen above features massive wheels and tires is based on the single-cab variant but looks hotter owing to its custom burnt-orange paint scheme, a snorkel, and a functional hood scoop. It's only natural for concept vehicles to spawn production models but this time around here is a production-spec vehicle that tries hard to mimic a show car. The modified Tata Xenon seen above takes inspiration from the Mercedes Benz Ener-G-Force concept and features a similar front fascia and several other minor modifications that help it look like the show model. These include a reworked hood, revised fenders, new alloy wheels, and a new loading-bay cover.